Last summer, I took a road trip through Guysborough County on my way to the town of Canso to enjoy a foot-stomping good time at the Stan Rogers Folk Festival, which is held every year on the first weekend of July. On my journey, I found some treasured places that the troubadour himself may have trod. Canso is on Nova Scotia's wild and windswept eastern tip. En route there, I stumbled across the timeless fishing village of Little Dover, NS; then I lucked into the nearby Black Duck Cove day use park. The park bills itself as "a unique sampling of the wilderness coastline of eastern Nova Scotia." I just call it awesome. It has a tucked-out-of-the-way swimming beach, coastal trails, picnic areas, boardwalks and gravel trails, all on a gentle 3.5 kilometre loop. It's perfect for families (my three little lassies scampered around to their hearts' content). It's also good for a romantic stroll, or for just getting out to enjoy nature. That's the thing about Nova Scotia's Guysborough and Eastern shores: they're full of hidden gems. Just ask Helen Murphy. "I love Tor Bay Provincial Park and Beach," says Murphy, publisher of the Guysborough Journal. "A lot of folks don't know about it. Rare white sand; giant, smooth rocks for sunning if you like, crashing waves on one side of the park, a tranquil cove on the other. Not populous. Amazing." 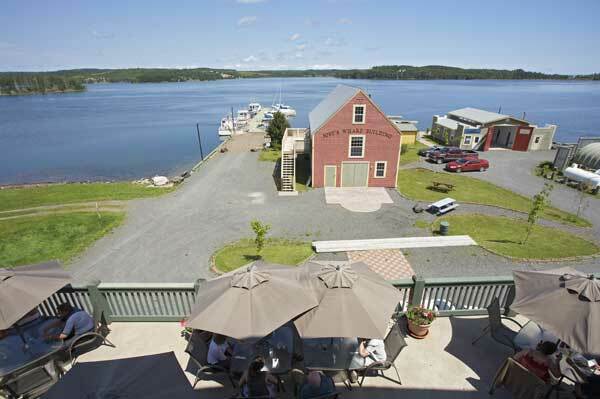 Murphy says Guysborough's charm is that, while it's vibrant, it hasn't really been modernized. "It's authentically historic and moves at a gentle pace. Every time I drive into the village of Guysborough I feel like a weight has been lifted off my shoulders. That's pretty powerful stuff!" Doug Anweiler paints an equally magical picture. A vice-president of marketing for the Authentic Seacoast Resorts, Doug has a real passion for the people and places along Chedabucto Bay. Among his favourite spots is the Lundy Fire Tower, which offers a spectacular view of Chedabucto Bay and a 360° panoramic view of the area. "It may be the best scenic spot in Nova Scotia," he says. Another highlight? Watching the community ceilidh while enjoying dinner and an ale on the waterfront deck of Guysborough's Rare Bird Pub & Eatery. "These young fiddlers and step dancers bring a tear to your eye as they perform Nova Scotia's traditional music to proud parents and grandparents." Anweiler has enjoyed weekend rafting on the Milford Haven River ("Best. Day. Ever," he proclaimed) and loves the beautiful ocean views from every fairway at Osprey Shores Golf Resort. Superb birding opportunities can also be found along the shore. The south shore of Chedabucto Bay, which is the most easterly point on mainland Nova Scotia, attracts almost 140 species during the breeding season. There is an eagle breeding area near Boylston in the summer; watching gannets dive for herring in the fall is unforgettable. Coastal hiking is a big attraction. The Trans Canada Trail (one of Lonely Planet's "Top 10 Canadian Adventure Experiences") starts at the Guysborough Harbour and moves up above Chedabucto Bay. "The lookout at Cooks Cove is spectacular. It has one of Nova Scotia's few suspension bridges. The trail follows the abandoned Guysborough train line, which was made famous by Stan Rogers in song," says Anweiler. "I could go on and on, but the best thing about the area around Chedabucto Bay is the people. Amazingly friendly-the type who don't just say hello on the street, but stop to talk. Everyone waves as you drive by. That spirit of hospitality can be hard to find in our world," he says. "For a moment you can imagine how people lived decades ago-clean skies, quiet, friendly, peaceful." Hooked, I returned to the area in October for a long overdue adult mother-daughter getaway. My mom and I drove up to the stately 10-room DesBarres Manor Inn for a Nova Scotia wine-pairing dinner and an overnight stay. Guysborough may be tiny, but praise for the Manor and its culinary offerings has been big. In the last four years, the Inn has won numerous kudos and awards, including two Wine Spectator Awards of Excellence. We didn't leave disappointed. Creamy seafood chowder, followed by a pecan-crusted North Atlantic salmon, all chased down with delicious homemade apple crisp set the scene for a very relaxing evening by the fire. As we happily toured around the area, Mom discovered some of her own highlights: the mustard pickles, modern treasures and old-fashioned items at Guysborough's Days Gone By Bakery, and the architectural charm of the 19th century homes that line Guysborough's waterfront Main Street. It's worth taking the time to explore the full breadth of the region to experience its foggy lighthouses, near-deserted beaches, and charming out-of-the-way coastal communities. Soon enough, you'll be creating your own list of favourite haunts.